Yep, you heard it. This is the first five minutes of Borderlands 2 's final DLC, Tiny Tina's Assault on Dragon Keep, which releases tomorrow. Be warned, though! There's a Borderlands 2 spoiler early on, so if you haven't gotten around to playing the base game yet, maybe don't venture in. Otherwise, I'll see you on the other side. Oh, hello again. Wasn't that nice? 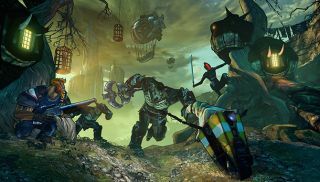 A lot's been made of the DLC's pen-and-paper roleplaying influence , but this is a nice look at the continued existence of Borderlands 2's shoot-and-loot gameplay. While I'm not sure Assault on Dragon Keep is for everyone—Tina's firecracker of a little personality might grate on some—I'm reminded of why I loved the series so much, and can't wait to get my snipe on again.